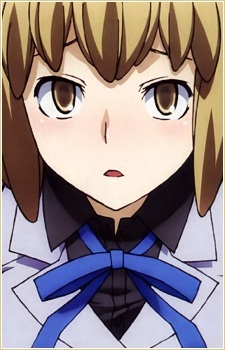 Io attends the same school as Hibiki and Daichi. She’s an honor student and considered a dream girl for many guys since she packs brains and beauty. Io is a polite, conserved girl often unsure of herself at times. She is noted to also have a penchant for books. Until the last two days of the game, she constantly apologizes and compromises, agreeing with others and never expressing her own views. As the story goes on, it is heavily implied that Io is romantically interested in the Protagonist. She however has a strange confidence about confessing her feelings on the matter though. On one hand, she is not afraid to tell the Protagonist that she is able to go on because he is there for her. She dies in episode 12 after consumed by the void along with Daichi.